The magnetic field of the Earth is contained in a region called the magnetosphere. The magnetosphere prevents most of the particles from the sun, carried in solar wind, from hitting the Earth. 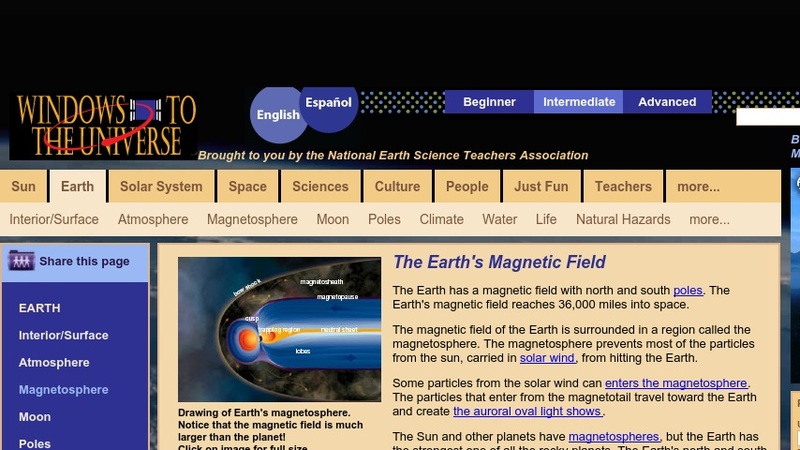 This site, produced by the University Corporation for Atmospheric Research (UCAR), uses text, scientific illustrations,and remote imagery to explain the occurrence and nature of planetary magnetic fields and magnetospheres, how these fields interact with the solar wind to produce phenomena like auroras, and how magnetic fields of the earth and other planets can be detected and measured by satellite-borne magnetometers.